Featuring a cutoff "facula line" that deflects the top portion of the beam downward, away from oncoming traffic and pedestrians, the BC35R LED Rechargeable Bike Light from Fenix Flashlight is designed for the demands of urban cycling. Its Cree XHP50 Neutral White LED provides brightness settings of 45, 150, 400, and 1000 lumens, along with an 1800-lumen burst mode and a 150-lumen flash setting for times when it's most critical to be seen. 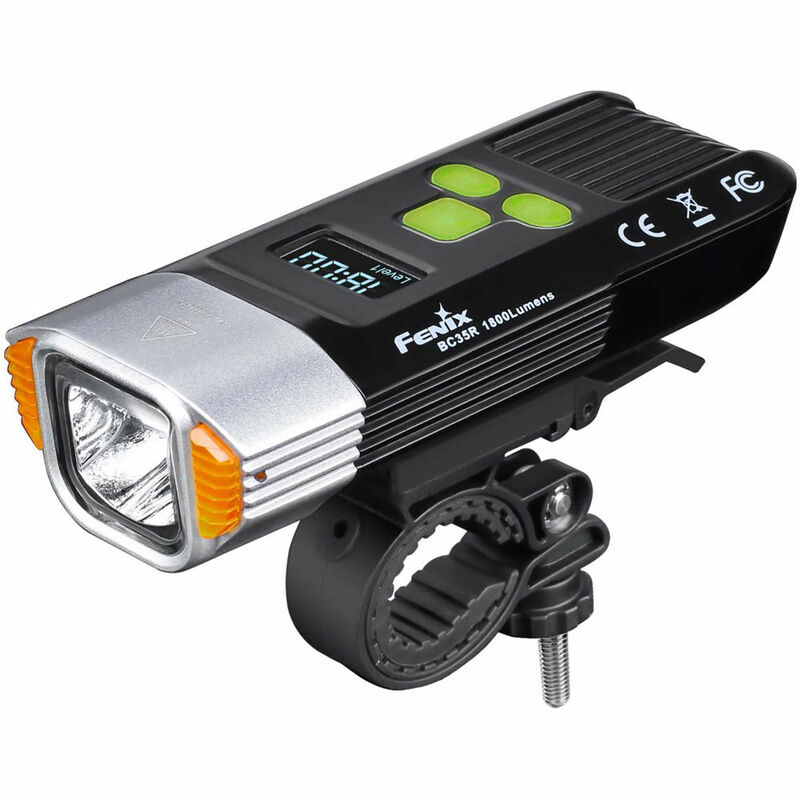 The micro-USB-rechargeable light is controlled by a push-button power switch and "plus" and "minus" buttons to increase or decrease the beam brightness. All the buttons are backlit for easy visibility in the dark. Included is a remote switch that lets you hit the burst mode when you need maximum light. A digital LED display shows current output level and remaining runtime; click the power button for a graphic of how much power is left in the light's built-in, 5200mAh lithium-ion battery. Runtimes range from 2.2 hours on the turbo setting to 28 hours on low power. The BC35R is equipped with an alarm that emits a piercing, 110-decibel tone if anyone attempts to move your bike with the security key removed. Water resistance rated at IP66, the BC35R can withstand rain. It comes with a quick-release mount, mounting shims, and a USB charging cable, and is covered by the Fenix lifetime warranty. Box Dimensions (LxWxH) 8.3 x 6.2 x 2.2"